The Crooked Tree Arts Center (CTAC), located in downtown Petoskey in the old Petoskey United Methodist Church, is a place where artists from around northern Michigan can show off their talents and have their artworks displayed to the public. 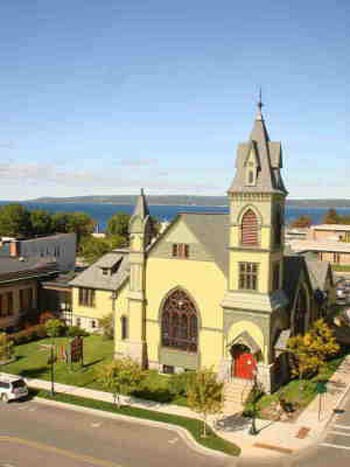 This unique arts center has been a part of Petoskey's history for nearly 40 years, and continues to be an important part of the community today. The beautiful restored arts center holds two art galleries, a 235-seat theater; studios for dancing, pottery, painting, and music lessons; offices, and meeting rooms. The center focuses on Charlevoix and Emmet counties and has evolved into being an important historical structure that visitors and residents in Northern Michigan can enjoy. The Crooked Tree Arts Center's Art Tree Sales Gallery, which is located inside, sells different art pieces from members as well as from artists from around Northern Michigan. The gallery is open year'round and is the showcase for outstanding artwork. More than one dozen visual art exhibitions are mounted each year within the two galleries. An active docent programs helps interpret these works for school children who visit and then participate in related hands-on activities. Plays, films, concerts, and recitals fill the auditorium with performing artists and their eager audiences who have supported an ever-growing calendar. Each session of the Community School of the Arts offers more than 350 hours of instruction in music, art, and dance. The Crooked Tree Youth Orchestra and the Beginning Strings Program are among the newer programs to have sprouted from the branches of the Crooked Tree. CTAC also takes its show on the road with in-school performances throughout Charlevoix and Emmet Counties by a variety of performing artists. The Crooked Tree Arts Center has events year 'round that include painting in the kitchen of the center, exhibits, gallery walks, lectures, performances and much more. Visit this historic spot and look in on the art that is on exhibit as well as shop in the Art Tree Sales Gallery. During the summer months, Concerts in the Park brings music and entertainment to downtown Petoskey. Boyne City Area Art Galleries -- Visit the Boyne City area to check out some of the art galleries found there.